The Four Points by Sheraton San Diego is conveniently located in the heart of the San Diego Business District, just minutes from I-15, 163 and the 805 freeways. Offering 23,000 square feet of banquet and meeting space, both indoors & outdoors makes this the perfect place to plan your next convention, reunion or social function for 10-1,000 people. You and your guests will love the Grand Pavilion, that overlooks the golf course, a beautiful garden gazebo, spacious atriums and a sound-proof ampitheater. The hotel isn't the only amazing thing in the area; take a little drive over to Sea World, the world famous San Diego Zoo, the Del Mar Raceway, LegoLand, San Diego Wild Animal Park, and of course, the world renowned San Diego Beaches in Southern California. There are plenty of shopping , dining and entertainment venues nearby as well as night clubs to suite everyone's preferences. 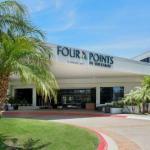 The Four Points By Sheraton San Diego offers 225 guest rooms, including 7 Suites. Each guest spacious room includes telephones with computer modem capability and voice mail, a large well lit desk and work station, an iron and ironing board, a coffee maker with complimentary Starbucks Coffee® and tea, In-room Nintendo systems and Pay-Per-View movies as well as Cable television, with CNN, ESPN, Showtime, and more. The four points provides complimentary shuttle service to and from the San Diego International Airport from 5:30am to 10:30pm. T1 High Speed Internet access is also available in all guest rooms and meeting facilities, and wireless internet is available in the lobby and public areas. Ask about the Montfield Club program, which includes a full American breakfast buffet and omelet station, a dinner and salad Buffet, hosted evening beverages, dinner meal and drink credit in Citrus restaurant, one complimentary round of golf and seasonal Tuesday night BBQ's. Parking: Yes, there is parking. Parking is complimentary.